I went pretty far back in my photo archives to find this one. It's from my 1997 trip to Cambodia and Vietnam when my brother and I were traveling from Phom Penh by car to the border with Vietnam. 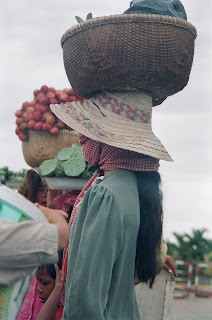 We were waiting to cross the Mekong River and there was just something about this woman that I liked. I have this photo up on my wall just above my computer so it's one of the ones I look at multiple times each day. That is a lovely profile shot. (And I wish I had posture that good!) I so much want to see what her face looks like. That is a fabulous photo...thanks for sharing. The composition of this photo is amazing. Nicely done. There is so much to see in this photo. The colors are so serene. That's amazing! She has the straightest back I've ever seen. I wonder what's in her basket? Very nice photo. I like the colours and the composition. I love a photo with a story. Very nice capture.